For those of us who've been around a while, the once impossible-to-pronounce name of Nav-ratti-lova, is now a household, and easy-to-pronunce word. Some of use just call her Martina. This tennis phenomenon just keeps getting better and better at what she does. 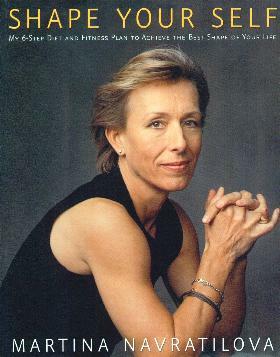 Her dominance of the Women's Tennis circuit is legendary and she's still playing competitive tennis at the age of 49! In the introduction to her book, I loved her saying, "Getting in shape really starts with this advice: Don't let age get in your way. Don't let age define your identity or govern what you can or cannot do. Look at your ability, not at your age." Sound advice. Now, not many 40-somethings can ever hope (or even dream) to become a "Martina", but her advice can certainly nudge us in the right direction. And heaven knows, we need to do something about our eating habits. She enlightens us with a little background information about her own eating habits and training routines which she hopes we'll follow. She's a sterling example of what one can achieve healthwise and is living proof that "we are what we eat". This book is extremely positive and encouraging and Martina recalls moments from her past to illustrate a lot of what she's writing about. It's not only about eating healthily and doing a certain amount of exercise, it's also about one's mindset and attitude towards reaching your goals, and remaining focused on the task. The information on food, and her 28-day meal plans (some recipes) to help us eat better, and get ourselves on track, is incredibly interesting and worth taking notes for future use. I found this passage enlightening: "Carbohydrates are important in another aspect: They break down into glucose, which is the major fuel for immune cells. Low blood glucose also triggers the release of stress hormones that suppress the immune function, so a drop in blood sugar during and after prolonged, intensive exercise can reduce immunity. If viruses and bacteria gain a foothold during this window of opportunity following hard exercise (3-72 hours), you are most susceptible to getting sick". So that's why we hear of fit and healthy people getting sick. There's also an illustrated exercise section - vital and extremely interesting. She goes into details about exercising in order to get the most out of your body and to make it healthy and strong. Who knew the lengths we should be going to so we can be as fit as we should be, without much effort! I recently saw Martina on TV at the French Open Ladies Final looking beautiful and gracious - a picture of health. And, her humble and moving acceptance of a painting had us all in tears and goosebumps. She's really a perfect example to us all - men and women. Go Martina! Visit her at her website at www.martinanavratilova.com. Conclusion - An extremely necessary book for everyone. Oh, and how you mattered, Martina!